“The answer lies within.” We hear it from the loftiest spiritual teachers to heavy metal bands like Dream Theater, but how do you do it? Often shrouded in mystery, it's had many names: clairaudience, second sight, and intuition. 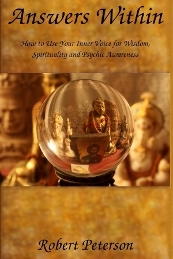 In its stronger forms: talking to angels, spirit guides, or your inner voice. Whatever you call it, it's a skill you can learn, and its roots lie in the subconscious. But only crazy people talk to themselves, right? Wrong. Psychologists have known about the unconscious mind since Friedrich Schelling coined the phrase in the 1800s. Whether we like it or not, it always influences us. Many think the subconscious is a dark, murky place; the cesspool of our minds, but experience shows it's a direct connection to what New Age people call the Higher Self, which has a world of psychic information, guidance, and spirituality. The biggest obstacle to inner voice communication is conditioning: we're taught from day one to focus on our five senses, and that everything else (what's inside) is unimportant or untrustworthy. So the first step is to undo all that negative programming. The next step is to learn to turn your attention inward, and maintain that link throughout the day. The trouble is, we're usually given vague (or worse, incorrect) instructions. It's often described as one-way communication steeped in mysticism or religion: perform a ceremony, cast a spell, recite a prayer and hope for the best. But the communication flows both ways; we just don't realize it because our brains have complex noise filters to keep “what's not important” from bubbling to the surface. It's like hearing a whisper in a rock concert; the signal is too weak to hear over the noise. Meditation is only part of the equation. It helps dismiss some of the musicians, guitars and screaming audience from our inner auditorium of everyday life, but we still have to listen for the whisper. Play “the wisdom game.” Make time to ask yourself philosophical or religious questions and pretend you're the guru. Pause your inner dialog to get stray thoughts; take the first ideas that pop into your mind and morph them into “wise” answers. Take walks and try to see everything around you as a spiritual metaphor, and tell yourself its deeper meaning. Expand the game: Instead of philosophical questions, ask yourself to just “Say something wise” and make up answers. Each morning, give yourself a spiritual lesson for the day. Just make something up. Make every day a spiritual learning experience. Throughout the day, ask yourself to comment on what's happening; check it against the lesson you gave yourself. Increase psychic sensitivity by being love-based and non-judgmental. Ask about other people's lessons. Learn from what other people are going through, but don't mistake their lessons for yours. Don't doubt yourself. Gain confidence through verification. Recognize the voice of fear. Pay attention to impressions accompanied by a detached feeling of peace and calm. Discard impressions accompanied by fear, negativity or strong emotions. Use music and books to increase inner voice vocabulary. Keep a “running question mark” in your mind. Try to remain open to messages from your inner voice throughout the day and in every situation. Keep playing and eventually you'll start getting “answers” without questions. Learning to talk to your inner voice is an invaluable tool for spirituality and psychic development. Making it fun and being persistent are key. 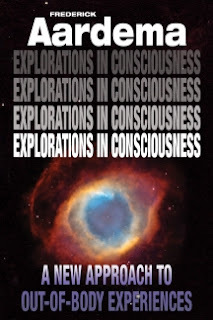 "Recall the fundamental law of astral projection: when the subconscious will becomes possessed of the idea to move the body (coinciding bodies) and the physical body is incapacitated, the subconscious will moves the astral body out of the physical." In other words, if your body is under sleep paralysis, and your subconscious wants to move, your astral body will move away from the physical. What I've found is that I can consciously try to induce an OBE for hours and get nowhere unless I'm in the right state of mind. But my subconscious can take me out-of-body easily, quickly and efficiently whenever it's motivated to do so. So one important tool for inducing OBE is motivating the subconscious. It is very easy is it for your subconscious to pull you away from your body, because it's done it your whole life: it pulls you out of your body every night during sleep. Typically, you just hover above the body, watching the illusion of your dream hallucination, and you're completely unaware of the OBE because you're unconscious. It pulls you out-of-body as soon as you fall asleep. In fact, your subconscious waits passively until it believes your awareness is completely extinguished, then it pulls you out. If you keep your conscious mind completely, totally, utterly blank (quiesced), your subconscious can be fooled into thinking that you're unconscious. Your mind has to be quiet and inactive enough that your subconscious can't tell that you're still aware. Once it pulls you out of your body, you can wrestle conscious control away from it, and voila: you're out of the body. How do I know this? I've seen it firsthand. I've done it successfully. I've also tried to wrestle control from it too early, with interesting results. My subconscious (which I become very aware of) acts very surprised by this rude intrusion into its normal dealings, as if to say "WTF? How did he manage to slip through?" Then I get forcefully slammed back into my body: wham! Apparently it doesn't like me interfering with its nightly falling asleep routine! Despite experiences like this, your subconscious can be trained, and it can help you with your OBEs. Not during the falling-asleep process, but during your "normal" OBE practice sessions. I've mostly been resistant to hypnosis my whole life, so it doesn't work for me. Consequently, the OBE hypnosis tapes and CDs don't work on me. Changing your inner dialogue is a complex subject, and this article's already getting too long, so I'm not going to cover it here. Your subconscious communicates in many ways, but it's not designed for language interpretation or complex linguistic analysis. So a long sentence will just confuse it. Long sentences will just be ignored and do you no good. Imagination and visualizations are better. Your subconscious is very literal. It will interpret negative sentences negatively. For example, if you affirm "OBEs aren't difficult" your subconscious might only notice two words: "OBEs" and "difficult", and you've just made your job harder. On the other hand, if you affirm it in the positive, your subconscious will interpret it the way you want: "OBEs are easy." Don't try to give yourself too many affirmations at once. One per day (or maybe two) is all it takes. If you start rambling to yourself in a long discourse, your subconscious is going to get confused. Don't say to yourself, "OBEs are easy. I have them all the time. It comes naturally. I want to have OBEs. I slip easily out of my body. I become conscious while I'm asleep..." because it's too much information for your subconscious to handle. Just pick one simple sentence per day. You can use a different affirmation each day. When you first wake up, your subconscious and conscious are more closely in communication than at other times of the day. In fact, the groggier you are, the better. Use that to your advantage. Your subconscious is programmed by repetition. Each time you repeat the affirmation to yourself, the more it becomes ingrained. But do NOT just repeat an affirmation twenty times, then let it go for the rest of your day. You have to repeat, but at different times. It's better to affirm once or twice, then do something else and repeat it again later. For example: When you first wake up in the morning, before you sit up in bed, affirm "I leave my body". Then sit up in bed and say it again to yourself. Then visit the bathroom. When you're finished, affirm it again. Then, go get that first cup of coffee, and while you sip, affirm it again. Affirm it at every meal. Every bathroom break. You get the idea: make it a habit throughout the day. In a way, you're changing your beliefs about yourself. Your subconscious is much more comfortable with pictures than words. It's much better to do your affirmation as a visual image than a bunch of words. So when you affirm "I leave my body" it's more effective to visualize yourself leaving your body. The idea of leaving your body is much more potent than the words. The words pale by comparison. When I started using affirmations, I didn't know what I was doing, so I made mistakes. For example, I once used an affirmation like "I can easily slip away from my body." That affirmation seems innocent enough, but I had a core belief that interfered. I had read somewhere that OBEs can happen easier when you are sick: when your body is weak, it has less hold on you, and your subconscious is more apt to pull your astral body out in order to recharge. So my subconscious interpreted this simple affirmation as "I want to get sick, so slipping out-of-body will be easier" and the net result is: I got sick. And this happened multiple times until I figured out what was going on. The bottom line is: be careful how you formulate your affirmations and make them positive, associating them with healthy, normal behavior. The self-questioning trick is something I developed for remembering my dreams, but I soon discovered it works for any affirmation. I wrote about this in my latest book, Answers Within. Basically you do this: (1) Affirm what you want, (2) Visualize yourself happily attaining your goal. (3) Ask yourself, "Is that what I really want?" (4) Tell yourself, "Yes, that's what I want." Then repeat these steps at least three more times. So in the beginning, I learned to remember my dreams by doing this: (1) I'd say to myself, "When I wake up, I'll remember my dreams." (2) I'd imagine waking up and happily recalling my dreams. (3) I'd ask myself, "Is that what I want? ", (4) I'd tell myself, "Yes, that's what I want." And I'd do this four or more times. When I adapted it to OBEs that became, (1) "I have OBEs." (2) Imagine myself leaving my body, (3) "Is that what I want? ", (4) "Yes, that's what I want." A lot of spiritual teachers warn against stating wants. One theory is this: If you affirm "I want to have OBEs" your subconscious will act on the primary verb in the sentence: You will "want" more effectively. You won't have any OBEs, but you sure will "want" them better. But if you affirm "I do OBEs" your subconscious will act on the verb "do" and actually help you do the OBEs, not just wanting them. This is similar to the issue of "wanting" above. You should avoid affirm term "I wish" because that is loaded with connotations that your subconscious will interpret literally. If you affirm "I wish I had OBEs" you are implying to your subconscious that you do not currently have them. Even if it's true, don't do it. Your subconscious can interpret this as "OBEs are lacking in my life: I don't have any OBEs" which is the opposite of what you want. So always affirm their presence, not their absence. OBE affirmations program your subconscious, and that, in turn, makes them more frequent in your life. You probably won't see immediate results. In fact, it may be weeks or months before you make any progress, so be patient and keep your subconscious motivated.